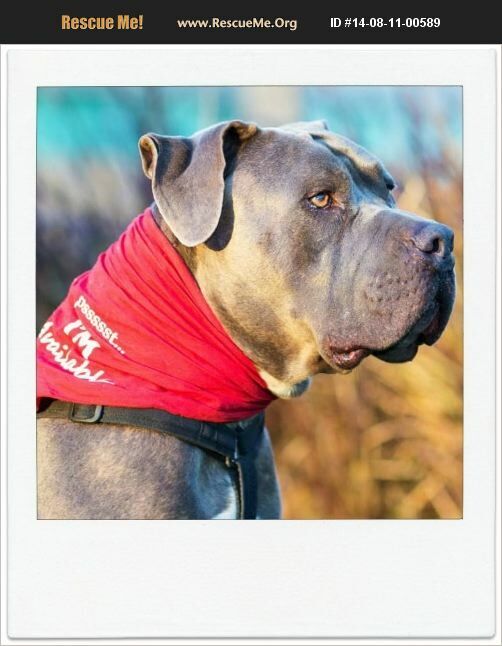 California Mastiff Rescue View other Mastiffs for adoption. Meet SHERMAN | FOSTER TO ADOPT | EMAIL: ADOPTIONS@WAGGINGDOG.ORG | SOUTHERN CALIFORNIA ONLY | Oh Shermie... this gentle 95 lb. giant has been part of the WDR family since January 2013. We plucked him from a municipal LA shelter and adopted him to a family that spring. We thought we made a good choice for our boy, but alas he was returned to us in August 2014. His family wasn't able to help him with his separation anxiety; in fact, they didn't try even though they promised to give him their all. Instead they gave him all of their food and treats but no leadership, exercise or mental stimulation to go with it. He came back to his rescue at 112 lbs., depressed, obese, and having forgotten how to DOG. We were crushed. With the help of a team of dedicated volunteers who spent time with Sherman at his boarding kennel, the next several months brought Sherman back to himself and reminded him about things that balanced dogs like to do (such as using their noses and brains, enjoying the company of other life forms, enjoying the walk). Unfortunately Sherm's distress over being alone in a home environment kept him out of a family and home life. Until Allison. Lucky Sherman was able to move to our most skilled foster care provider's home where he's worked on crate skills, inside manners, and has a bevy of doggie friends! We're SO proud of him and thrilled that this beautiful, sweet dog finally gets to enjoy some of the luxuries of a pampered house pet. And we're so grateful to his amazing foster mom Allison, with Peticularly Perfect Pet Care, for giving him this opportunity and teaching him these valuable lessons. Sherm's been working hard on his distress level when people are gone and has learned to respect the boundaries that have been established. Even though he's a big mushy love, he's still got a stubborn streak as wide as his forehead ;) and like most blockheads, he'll test limits every now and again. The Sherminator is ready leave his foster momma's care, and we hope he can find a FOREVER family who can take over where she leaves off. She'll ensure his future family has all of the info they need to succeed, and WDR will do everything possible to make his next move a forever success. We're looking for DOG SAVVY, large breed experienced folks in Southern CA with another well matched mellow companion dog to keep the boy company. A clear understanding of the importance of leadership in the human-dog relationship is a must. Homeowners preferred in a single family residence with secure backyard. Renters will need renter's insurance and landlord approval. Sherm prefers a feline free environment. The big love is bomb proof with humans of any size, the most loving and gentle giant around. He'd be super excited to have a large family of his own very special people. If you're interested in being the forever family that our Shermie has been waiting forever to meet, please inquire. --- TO VIEW ADDITIONAL PUPDATES AND PHOTOS OF SHERMAN, PLEASE VISIT HIM ON FACEBOOK AT: https://www.facebook.com/media/set/?set=a.546234702067702.125556.294289027262272&type=3 ---) ------) TO VIEW SHERMAN IN ACTION, PLEASE VISIT HIS YOUTUBE VIDEO PLAYLIST AT: http://www.youtube.com/playlist?list=PLKp8buw7HyCallz74y3QUxY_82hk2n5Ev ------) UPDATE 11/17/17: Sherman has an adoption pending and is now in a Foster-To-Adopt (FTA) period with a potential adopter. During this period, the adopter and dog have a chance to try each other out and make sure this is a perfect match. If things don't work out, the dog will return to the rescue and be able to meet with other adopters. Otherwise, the adopter can finalize the adoption at the end of the FTA period or any time during, at which time our dog listing will be removed. Meanwhile, we are still accepting applications and encourage you to contact us as soon as possible if you are interested in giving this dog a loving home.